Believe it or not – Leavenworth KS was established 11 years before Kansas City. Which, makes Leavenworth a very old town – sitting on the west bank of the Missouri River. Fort Leavenworth was built in 1827, the city became known for its role as a major supply base in the settlement of the American West. How cool is that! So, the original buildings and homes of Kansas City were constructed with materials from Leavenworth KS. Our team has worked in Leavenworth KS on a few projects, and let me tell you – that town is so cool! Just the drive itself, from KC, is absolutely stunning! From our office in Briarcliff, you will cross over two major rivers on the way there, the Plattte River and the Missouri River. It’s pure country – rolling hills and beautiful valleys with trains passing through it all. It’s one of the only areas in the Kansas City that hasn’t been developed. Reminds you of old western movie! This house is located in the heart of down town Leavenworth KS. Not sure the age of the home, but typically, homes located more central to town-down are the originals. These floors had black paint layered on top. 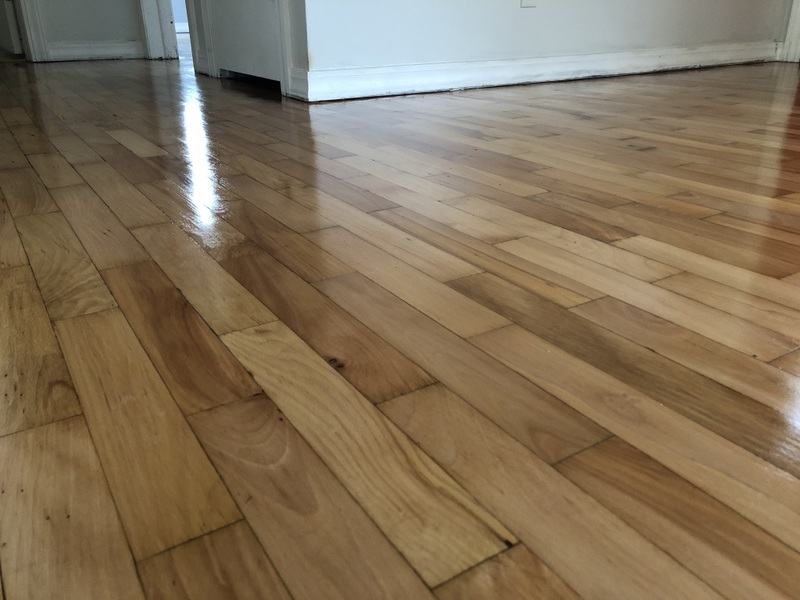 When we began sanding these floors, we noticed that they were not oak. 98% of hardwood floors throughout the Midwest are Red Oak or White Oak. So, when we revealed these beautiful maple hardwoods, we were so thrilled! Maple is a domestic hardwood. It’s more expensive than oak – for one reason. Maple is a slightly tougher material. This is why gym floors are strictly constructed with maple flooring. Maple flooring is literally the only hardwood that is allowed to be used for gym floors. 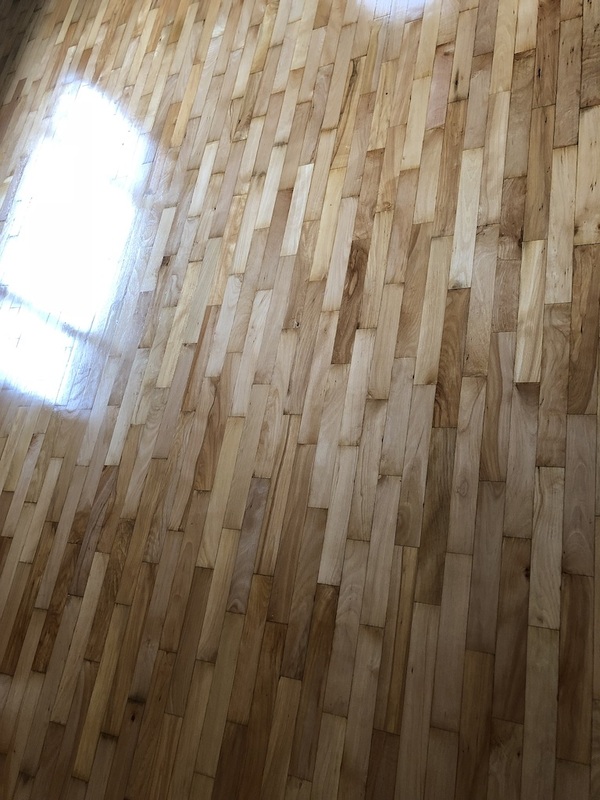 Don’t even think about changing the color of a maple floor! 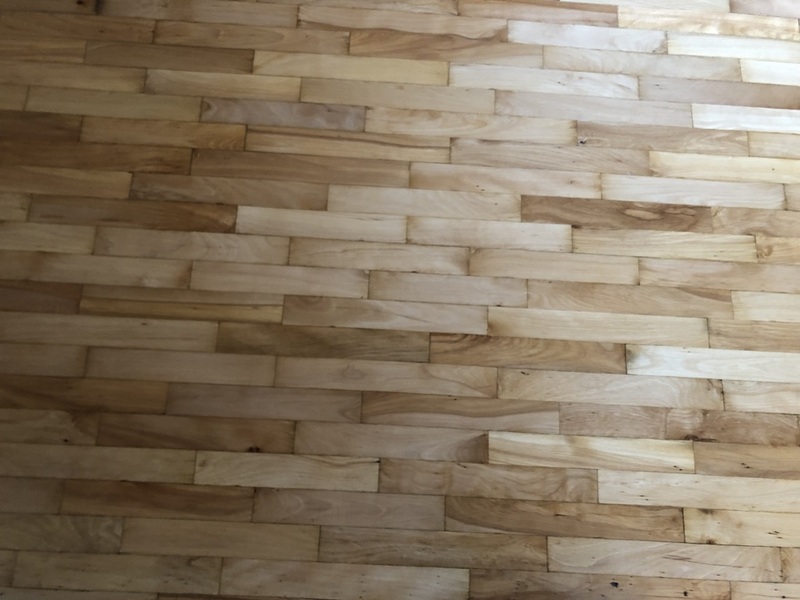 It’s near impossible to stain a maple floor. Flooring professionals will always recommend refinishing natural without applying stain colors. Maple just will not absorb stain colors like oak. Trust us, we’ve tried it – the entire floor looks splotchy and inconsistent. Seriously, painting the entire floor would’ve looked better! Water-based poly’s have 3 hour dry times. This allows you to move back into your home quickly after the final coat has been applied. It’s recommended that you still wait 48 hours before putting back furniture and 7 days before rugs go down. Rugs will restrict airflow and prevent the poly from curing completely. Water-based poly may need to be recoated every 3 years. Water-based has a thinner build layer than oil-based poly and will not hold up to foot traffic as well. However, water-based finishes are safer to be around. There’s hardly a smell and require minimal ventilation. Oil-based poly’s have a 13 hour dry time. This will prolong your move-in date. Oil will amber over time and water will hold true to the natural look. Oil is a much more durable finish than water-based. With proper maintenance, you can go 20 years without ever re-coating the floors. Oil has a very potent smell and can be harmful to your health. Even with maximum ventilation, your home could take up to a week for the odor to clear out. Foot traffic is recommended after 24 hours, furniture back after 48 hours, and rugs back down 2 weeks after final coat. Our opinion – we always recommend oil-based poly for protecting all species of hardwood floors. We strongly believe that oil-based finishes are the best bang for your buck. It’s cheaper than water-based products and will last 10 times longer. Remember, that hardwood floors take a beating over the years in your home. 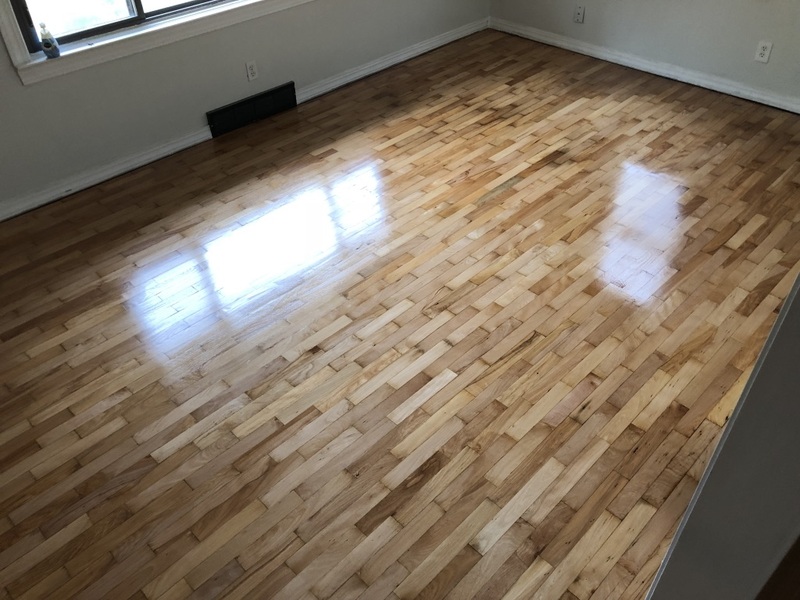 Infinite human and pet traffic, robot vacuums cruising around, spills, dropping items, contractors working on other projects, sliding furniture, potted plants leaking, and numerous other things will test the durability of your hardwood floors. Consider oil-based – you will thank us in the long run. 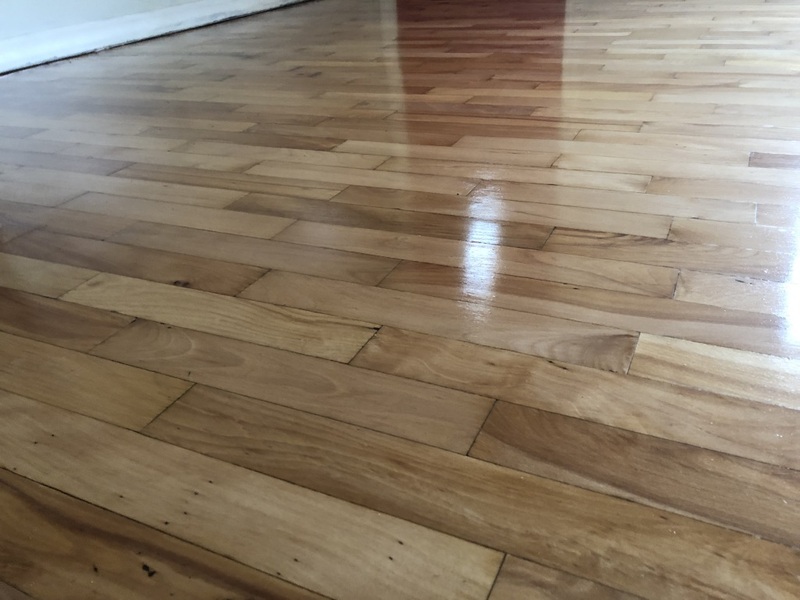 How to clean your hardwood floors? 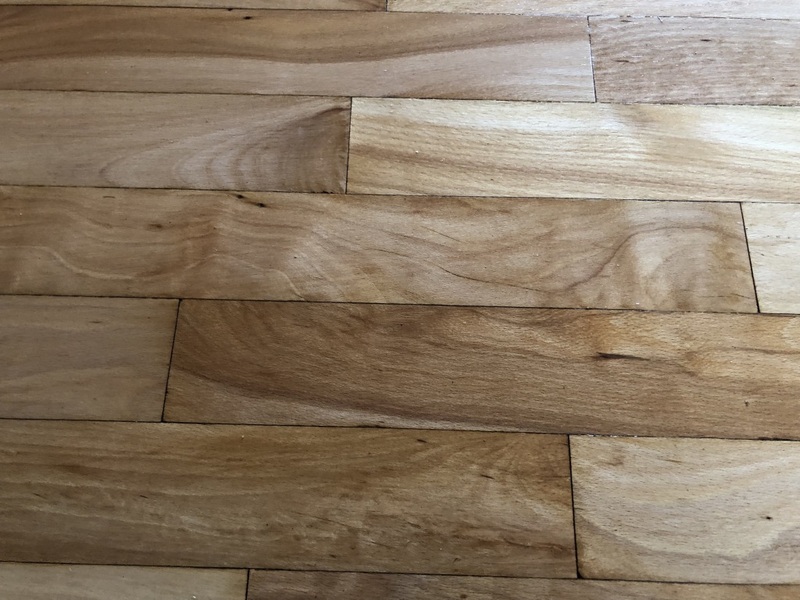 Can you refurbish pre-finished hardwood flooring? 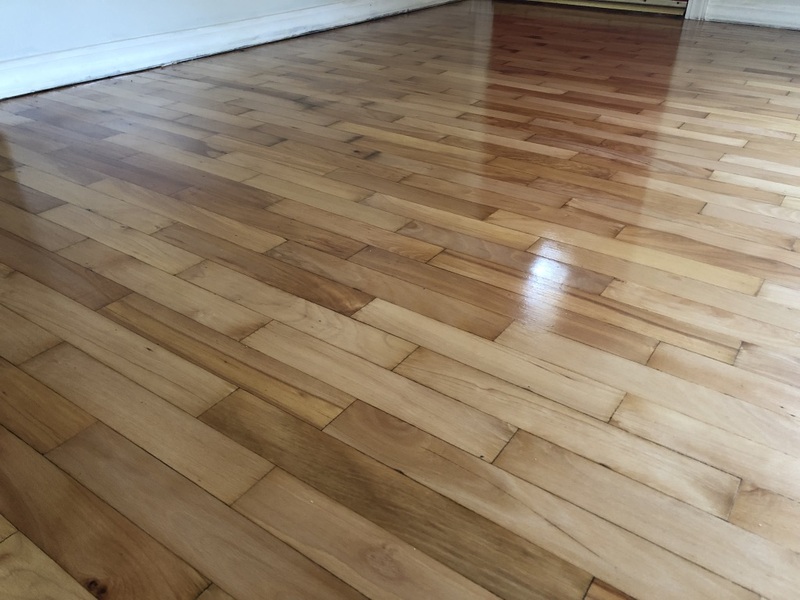 A few tips to keeping your hardwood floors looking amazing.